For custom inground swimming pools in the greater Hartford area, consult the experts at Landmark Pools. 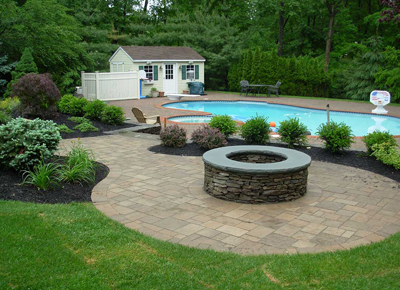 We have been the leading builder of custom in-ground swimming pools in greater Hartford for three decades. Build a back yard oasis, your personal vacation getaway, in the form of a custom built in pool. The expert design and build team at Landmark has what it takes to create your beautiful custom swimming pool and spa. For those of you who enjoy outdoor living, we will build you the pool you and your family are certain to enjoy for years to come. Landmark Swimming Pool Contractors are well known for our world-class gunite in-ground swimming pools, salt water pools, and spas. A full-service swimming pool company, we also offer pool and spa maintenance and repair services. The swimming pool contractors at Landmark design and craft your custom pool to complement the topography of your property. Many types of in-ground pool construction may be employed. Since we focus on custom design, we find gunite construction to be more versatile than a traditional poured concrete pool. Gunite is a highly durable product and allows us to create a pool in just about any shape. Gunite pools use a rebar framework that is sprayed over with a concrete and sand mixture. The method is preferable over a traditional poured concrete pool that requires a wooden framework to hold the shape of the basin. The versatility of gunite swimming pools means more than the ability to create an unlimited array of shapes. Landmark Swimming Pools creates custom in-ground pools, custom gunite swimming pools, salt water swimming pools, spas, and swimming pool repair. With over three decades of pool building experience, we offer expert design and innovative construction techniques. Just like you, we are budget conscious. The swimming pool contractors at Landmark Swimming Pools can cater to our customers' dream pool and spa experience. Call for a consultation today (800) 545-1460.